The kabuki has hair of animal　on the head. Special feature: On the iron plate, rib bones are engraved with silver color. Sode: green, black brown, brown and also orange coolr Hon kozane. Kote: The iron Uchidashi style nice shape. On the top, attach the Sode. This suite of armor is quite unique and good condition. Menpo : Mumei The Suga of this Menpo is very long. 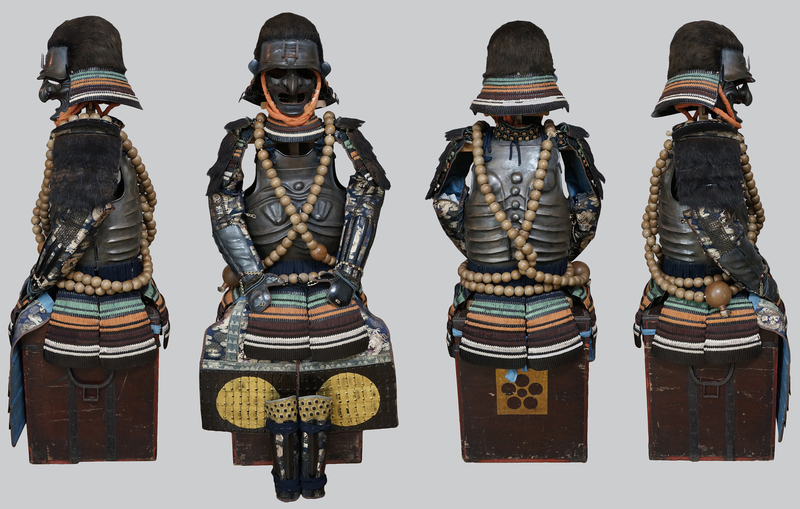 Yoroi and Kabuto (Armor) : made in Meiji era or younger. Menpo Mei (signature) :Mumei (unsigned). Jidai(era): Edo period. Special feature:The Menpo is made from iron, and the back is red color Urushinuri. The condition is very good. Aoi-estimation paper. price：JPY 45,000-.